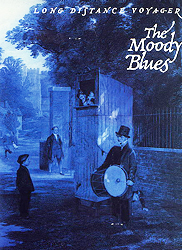 All Moody Blues items listed below are authentic and very limited. We do not carry multiple items. All prices and availability are subject to change. All prices include shipping and handling for all USA customers. All other destinations will require actual shipping cost to complete transaction. Have a question? Ask us before purchasing the item. Thank You. 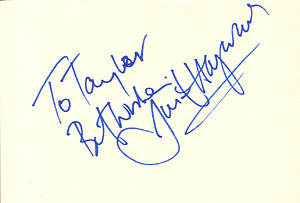 Description: 5x6 Autograph Paper signed by Justin Hayward in blue sharpie pens. Personalized to Taylor. 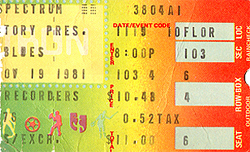 Note: Item signed on The Moody Blues 1990 US tour at the Starplex Amphitheater in Dallas, TX. 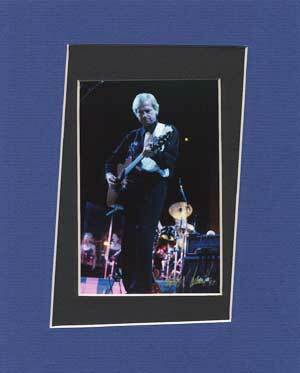 Description: The Moody Blues Long Distance Voyager Tour Book. Description: Original Moody Blues 1988 Prelude Tour - 8x10 matted 4x6 Photo #1. $15.00 Total Cost. Shipping Included. 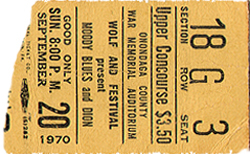 "This was my first Moody Blues concert. One of the first shows for me to shoot at Starplex as well. The lighting was great but the band themselves were not very active. 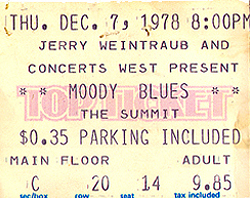 But what can you expect from the Moody Blues."